I asked, quite specifically whether he thinks he is, I stated that 'sometimes it seems' that way, because at times, it's hard to tell. Read some previous posts on here re Martial, it isn'y only me that has raised these issues. It doesn't mean I do not like him, or he isn't very nice guy etc... and if you disagree with my thoughts, that's fine. What I would ask is for you to compare Rashford and Martial, in terms of what you see, their approach during games, recent development and progress, and then make an assessment. Keep the debate of a decent quality, rather than senseless comments aiming to insult forum members. It's silly. I no longer make any real critique of Martial, because people on here, when it comes to him, are frightfully defensive, think it is somehow 'personal' and are loathe to suggest anything but platitudes for the guy. It's strange. Guy's a good player, but I don't know why so many get so flipping sensitive about him. Just fyi, nobody has ever said he is the finished article, certainly not Martial. I think he could improve by learning to put his laces through the ball a bit more and making a few more runs in behind. 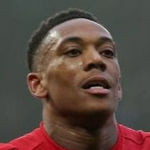 You're really running out of things to justify you shitting on Martial aren't you? Exactly, and then one remembers a certain Arjen Robben who made a career out of repeating one particular skill most of the time to great effect and the argument that players must constantly add new facets to their game to be relevant just goes straight out the window. Not saying Martial shouldn't improve but adding "left leg usage, heading, going outside, inside and on top" is just plain nonsense. You'll notice that I insulted nobody and that I've actually stated where I think he can improve. The reason I said what I said is because, you have, at every turn, shat on Martial. Yesterday he scored one of our goals of the season and got a nice assist and you come in here, questioning his mentality. It was always mocking those numpties that couldn't engage in discussion about him without getting aggressive, or accept any flaws in his game, expecting everything to revolve around him even when not performing great. Dunno who started it. This thread was toxic as feck though so I was all for mocking those that made it that way. Everyone wanted the same outcome and knew he could get there if he got his head down, and he has, or he's at least definitely getting there now (obviously the better system/manager has helped immensely). Some just pretended he was already there even when he barely touched the ball in a game. You see, that's where the issue emanates from and why it forever confuses you how the French lad can have the level of support he currently has. Your complete inability to acknowledge that Jose mishandled him and putting all the blame for his poor form on "not getting his head down" is just plain laughable at this point and worse as you now have hindsight to aid you. Oop here's one. Everyone watch. Twisted words, made up narratives and mental gymnastics in true style. This is one of the fellas Martial FC was about. I think Jose mishandled everyone, and regularly said so. I always wanted Martial to do well, and continually said as such. Now what's your argument when you can't make stuff up? You can't handle that anyone was frustrated with him for a while and for some reason can't see that that can happen AND someone want him to do well at the same time. You have to resort to nonsense. The difference in Martial since Ole came in is staggering. Obviously confidence and tactics are playing a huge role but what Iv noticed the most is his starting position. He’s a good 15 yards further up the field at least so when he’s receiving the all on the half turn or completely facing the oppo’s full back he’s already in a better position to make something happen. Under Jose where he was starting from much deeper it allowed the oppos defensive midfielder to gravitate over and put him in more 1v2 situations rather than now where he’s running full speed at the full back. Tactically it will be interesting if teams start flooding our left side to negate the Shaw-Pogba-Martial partnership as it will mean space will be much more limited. It’s where having someone like Sancho on the opposite side would just kill defensive teams gameplans as we would attack from very angle whereas now it’s predominately down the left. Let's drop the arguments, we have a fecking player on our hands, and more importantly, he wants to stay at the club for quite awhile as he is settled from the looks of it. Good times ahead. The lad is talented but is a certain type of character that needs nurturing. Ole in my opinion is doing that. The way he tapped the badge with his finger at the Emirates after scoring shows a confidence and positive mentality that has been absent for a while. Why are folk arguing? He's been wildly inconsistent because of many variables and everyone has some truth to their opinion of why he's been up and down. You can't handle that anyone was frustrated with him for a while and for some reason can't see that that can happen AND someone want him to do well at the same time. You have to resort to this nonsense. The bolded part is the issue, Martial allowed his off the field issues affect his game in Jose's first season and no one complained when he was dropped from the team then. From the second season on, it was mostly Jose's fault for his bad form especially after he had shrugged off Rashford's competition to become first choice LW and then the Sanchez debacle. This is where you and "MartialFCers" don't see eye to eye. I would not want to start doing a minute by minute chronicle on how Jose was being especially unfair to Martial but it played a bigger role in his bad form than "Martial not getting his head down." You are correct and he doesn't mind being pushed by the coach, something that LVG loves to do and Mourinho seemingly hates. At the risk of upsetting a few, from the little I have seen of him at Molde, he seems to be like LVG on the training pitch, pushing players and being very direct/honest. Tbf plenty of players had the talent to be comparable to Ronaldo though, but you have mentality being the one stumbling block (Quaresma) or injuries (Robben) preventing that from fruition. Would I love it if Martial wins a Balon d’Or one day? Yes. Would I lose any sleep if he doesn’t? No. As long as he is consistently good and help delivering us trophies, all is well. If he's half as good I'll be very happy with him to be honest. In the next season i see him getting the golden boot. Yep, that's exactly why having 2 threats on both wings is so important. Mata on the right bless his heart tries his best, but he just isn't a threat by himself. There was a point where he did a decent 1-2 with a midfielder and had a good head start, but the Fulham LB caught him up so easily. If we could get Pepe / Sancho this summer for our RW it would be huge. Yeah without a doubt right wing is the area in need of the big investment this summer. It will change the whole structure and balance of our team. At the minute we are predictable as our left side is so dominant and our right side is so narrow (either Jesse or Juan) that it floods the middle of the pitch. If we can spread teams out to defend the whole pitch we will see even more gaps for Pogba/Martial/Rashford. One other thing that doesn’t get spoken about in regards to this opinion is the fact we have the biggest pitch going so by maximising the space helps all our attacking players. When we have a right winger who cuts in and basically becomes a number 10 it floods the area in which we are at our strongest. I would be happy with a Henry level to be honest. Ronaldo and Messi are on a different league . I am excited with this guy at the moment. I think things are starting to fall onto place with him. He's about to take off. Psg aint ready for the sauce. I imagine this is the reaction he gave Jose when he was asking him to play as a LB. I presume it’s been pointed out a million times already but I immediately thought of Ronaldo’s goal against the same opposition when Martial scored. I remember so many people saying he hasn't been much better and didn't show anything different these games. The stats clearly show otherwise. Some fans only measure improvement on goals+assits but if we look deeper martial was very involved and contributing even without scoring. Didn't stop things like "he needs workate" "lacked intensity" or " needs to affect the game more"
Good piece from sky. People who have kept going on about him not scoring or assisting weren't watching our games properly or were just being bias(probably in order to fit their agendas). Things like goals and assists, especially in small samples like 5 and less games could also be determined by luck which was a bit of a case with Martial in his first few games since Ole took over. He was unlucky to not have grabbed more goals and assists. People should have looked at his chances created because things like assists are a consequences from those. He created the most chances and was unlucky not have bagged more goals. His overall play was clearly good but unfortunately some people only likened good games with goals and assits. Like mentioned Martial was unlucky to not have had more goals and assits but things would have always eventually evened out and that's what we're seeing lately from him bagging goals and assists again. That's why stats will always be overrated in football. You can watch a match and sometimes it tells a completely different story to how the stats look at the end. Compare the stats against Fulham recently, we completely dominated them but in the end the stats look fairly equal. That's why was scratching my head reading posts like this even after we had just come out from win and another good performance. I still struggle to understand why people rate the guy. Whens the last time he had a good game? He will always be largely anonymous over 90 minutes, whilst providing a goal every 4 or so games. That's not good enough. People will say he can improve but there's been absolutely nothing he's shown to suggest that it's likely. He's every bit as apathetic out there today as when we signed him. The team playing well is more important than any one player but when it comes to Martial specifically people's don't analyse his games rationally and just repeat lazy stuff they heard from somewhere else. He started poorly under Solskjaer but he's picked up in the last couple of games. In fact his performances are probably better now than they were under Mourinho - although he was already improving sharply when Mourinho was sacked. The main thing is that his off-the-ball stuff is getting better. He's staying with the opposition full-back when he overlaps, winning the ball back in deep areas, and most importantly he's making those killer runs when the ball's in the middle of the pitch or on the side. He's challenging the shoulder of the right-back all the time, which he wasn't doing before. He's got all the skills, so as long as he's working at the ugly stuff he'll be a top player. Got a feeling he is going to smash it tonight. PSG ain't ready for it. Come on Anthony! See that's where you're wrong. He might not have been scoring left and right but in no way was he poor. Probably lucky to go off at half time in many respects because that first half was shocking. Poor showing, it’s still too easy to limit him by just adding a second defender. He really needs to master playing off the ball in those situations more. Touching it deep, he’ll always see a second defender and won’t be able to have the impact he can have on a game. He was hardly involved in the match before getting subbed so using his sub as excuse is weird. Poor today. I feel he usually struggles against any decent side, any decent full back. Yeah, let’s hold the Cristiano comparisons for a bit. Hope he's fit for Newcastle. He's had too many muscle problems this season.